Play the game, now in Early Access, and get a unique opportunity to share your thoughts with Bethesda. Playing new and upcoming games at the PC Gamer Weekender in exactly two weeks will obviously be great—but what about playing them and having the chance to give your feedback about a game directly? Well that’s just what Bethesda is offering with Quake Champions. Not only will you be able to go hands-on with Quake Champions on the show floor, the team from Bethesda will be present through the entire event, ready to listen to your direct feedback. They want to meet the game's players face-to-face and hear your thoughts. Quake Champions is still in Early Access, so who knows? Maybe you'll influence some of the decisions made with the game as it heads towards full release. 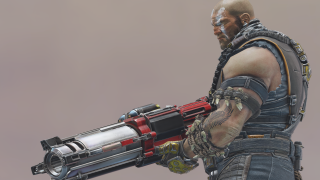 We’re already happy with how Quake Champions is looking, as you can read right here, but this is your opportunity to tell Bethesda what you think. You can find out more about Quake Champions over on its official site, and keep up to date on the goings on with the game on the official Twitter account. You’ll also be able to see many more speakers, games and booths all at the PC Gamer Weekender, which is being held February 17-18 at the Olympia, London, in the UK. For more details see the site, and follow us on Twitter for up-to-the-minute news. Tickets are available now from £12.99. Save 20% on all tickets with the code PCG.